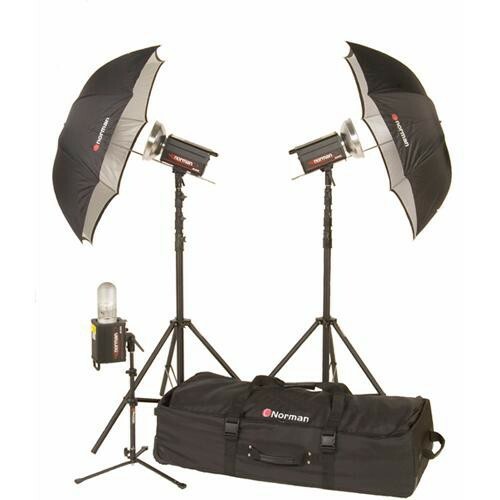 This is a Norman 3 "R" Monolight Travel/Studio Kit (120VAC) Kit. Norman monolights feature 5-stop adjustable power in 1/10 f/stop increments. Flash durations are short -- 1/1200 second for either the 600, or 400Ws models. 600 Ws models come equipped with 250 watt modeling lights, the 400Ws models have 250 watt modeling lights. The Norman ML series allows independent adjustment of modeling light levels. Each reflector is highly polished, with a properly-placed hole for an umbrella shaft. This hole allows correct center placement of the light beam, when an umbrella is used. Soft, wheeled kit case with liner and dividers, internal and external pockets, locking straps and handles. Dimensions: 18" x 44" x 13"
Box Dimensions (LxWxH) 46.0 x 19.0 x 13.0"